Tri-Lakes is situated 20 miles north of Colorado Springs on the high point of Palmer Divide. The towns of Monument, Palmer Lake , and Woodmoor make up this region and contain newly developed homes as well as more mature communities. Most shopping for the area is located in Monument, while Palmer Lake and the luxurious Woodmoor (with its 18-hole golf course) are residential areas surrounded by ponderosa pine and the rolling foothills below Rampart Range. Located around 7,000 feet above sea level, beautiful scenery, a slower pace of living, and access to three scenic lakes comfortable summers make this area attractive to many home owners. Convenient to Interstate I-25 for easy access to both Colorado Springs and Denver , the Tri-lakes region is also adjacent to Pike National Forest and bordered on its southern edge by the United States Air Force Academy. 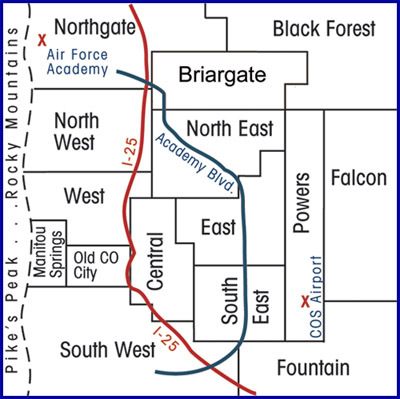 Gleneagle (also referred to as Northgate because of it's proximity to the North Gate of the Air Force Academy) is a 20 minute drive from downtown Colorado Springs. Located a mile east of I-25, this area affords amazing views of Pikes Peak and the Air Force Academy grounds. Northgate also boasts larger lots along with access to an 18-hole public golf course. Covering more than 200,000 acres over the east side of the Palmer Divide, Black Forest is a community of forested acres perfect for ranchettes and horse owners. A 15-minute drive from the conveniences of north Colorado Springs , Black Forest feels like a world away. Recreation opportunities abound with a county park, an equestrian center, and the serene 320-acre Fox Run Park. Located on more than 10,000 acres, the planned communities of Briargate have experienced a great deal of growth in the past decade. Offering abundant shopping, limited access roads, and green space parks, these residential neighborhoods provide a safe and pleasant living environment with lovely views of Pikes Peak. Tucked between the beautiful foothills of Rampart Range and the accessibility of I-25, the neighborhoods of northwest Colorado Springs include Pine Cliff, Mountain Shadows, Woodmen Valley, Peregrine, and the Rockrimmon subdivisions. Also located on this side of town are many hi-tech companies, including MCI. Gamble oak and ponderosa pine lend privacy to this area, and the abundant mule deer often drop by for a morning or evening meal. Powers Boulevard runs generally parallel to I-25 and is located just 8 miles east of downtown Colorado Springs. The area named for this road is one of the fastest growing neighborhoods in the Pikes Peak region. It offers new homes at relatively affordable prices on smaller lots with easy access to conveniences like shopping, movie theaters, and schools. Extending from the municipal airport and Peterson Air Force Base in the south to Black Forest on the north, the Powers area has become a preferred location for military families. The east side of Colorado Springs offers homes on rolling hills in mature neighborhoods built between 1970 and 1980. Close to schools and shopping and convenient to the restaurants of downtown, this area boasts larger lots, mature trees, along with some nice views of Pikes Peak and the Front Range. Between downtown and Manitou Springs is the area known by locals as the Westside. An eclectic blend of housing options has developed here over the years, from luxury properties in the golf-course community of Kissing Camels to 1950s ranchers within walking distance of Garden of the Gods. The Westside also offers a variety of duplexes and fourplexes in the established neighborhoods which include Holland Park , Kissing Camels, Pleasant Valley, and Cedar Heights. In addition to convenient access to the restaurants, businesses, and culture of downtown, this area offers remarkable views of Pikes Peak and Garden of the Gods. Situated at the base of Pikes Peak , Manitou Springs has been home to many people since the days when the Ute Indians camped near the rare mineral springs located here. Today, this quaint town a few miles to the west of Colorado Springs offers one of the country\'s largest National Historic Districts and many unique homes. Choose from renovated Victorians, hand-crafted cabins and cottages, as well as custom home neighborhoods. Just outside the door, recreation opportunities abound, with access to trails and Pike National Forest, as well as wonderful restaurants, galleries, and ample parks. Founded in 1859, Colorado City was the first capital of Colorado Territory. Located just west of downtown Colorado Springs, it was designated a National Historic District in 1982. Since then, many old home and businesses have been lovingly restored, making Old Colorado City a favorite destination for shoppers, artists, and tourists. The buildings in this area range in age from 60 to 120 years old. Find sturdy brick structures, quaint Victorian frame houses, charming stucco bungalows, and an abundance of other architectural gems. Residents also enjoy a rich sense of community through the many annual celebrations and regular farmers' market events. Bordering the Highway 24 corridor, Ute Pass parallels the route the Ute Indians took on their seasonal treks between the mountains and the mineral waters of Manitou Springs. The small towns of Chipita Park , Cascade, Green Mountain Falls, and Crystola make up the charming communities of this area. Properties offer rustic homes on steep lots among abundant pine and aspen trees. It's only 15 minutes either up or down the pass to convenient shopping, schools, and other amenities. Known as the "City Above the Clouds", Woodland Park is only 30 minutes from Colorado Springs at the top of Ute Pass , but it feels like a world away. Surrounded by Pike National Forest with stunning views of the west side of Pikes Peak , this charming mountain town offers modern convenience alongside a backcountry pace of life. Find a variety of housing options from townhomes to horse properties, most surrounded by the privacy of blue spruce, ponderosa pine, and aspen trees. In addition to cozy shops and friendly local restaurants, Woodland Park is close to many recreation opportunities. Hike, camp, cycle, fish, and snowshoe at the nearby lakes, rivers, and trails. For the slightly less adventurous, there's an 18-hole championship golf course with majestic mountain views. Ten minutes south of Colorado Springs lies an area locals call "The Valley". Made up of the small towns of Widefield, Fountain, and Security, these communities were originally a busy hub of agricultural and livestock activity in Colorado . Nowadays, a wide variety of housing has sprung up among the cottonwood trees and rolling plains. Choose from affordable older homes on quaint city blocks with mature trees, brand new townhomes in planned developments, or one of the small parcels that are still available for building a custom home. Shopping and local restaurants are always nearby.